Paper Cup Machine made in India ! 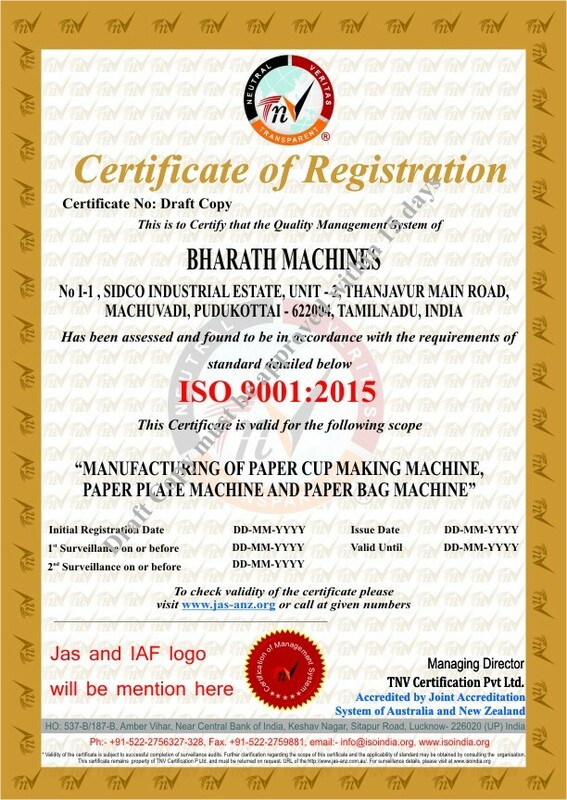 AR paper cup machine is now Bharath Machines, India. Our fully automatic paper cup making machines are being manufactured in India and exported to all over the world including new markets like Peru, Chile in South America due to its rugged construction and low running costs. Our paper cup machines are also low on initial investment though they comprised of the highest of Indian branded components like Siemens, TVS, Janatics etc., Our paper cup machines are favourite even among refurbished paper cup machine buyers due to its high quality construction and new machine like performance, after a low cost overhaul. Click here to view ISO 9001-2015 certification.